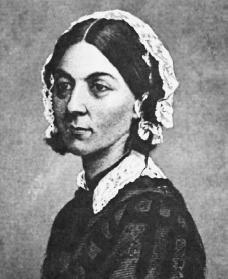 The English nurse Florence Nightingale was the founder of modern nursing and made outstanding contributions to the knowledge and improvement of public health. Florence Nightingale was born in Florence, Italy, on May 12, 1820; she was named after the city of her birth. Her father, William E. Nightingale, was a wealthy landowner who had inherited an estate in Derbyshire, England. Like many members of the wealthy class, he and Florence's mother, Fanny, dedicated themselves to the pursuit of active social lives. Florence and her sister, Parthenope, were tutored by their father in languages, mathematics, and history. Though Florence was tempted by the idea of a brilliant social life and marriage, she also wanted to achieve independence, importance in some field of activity, and obedience to God through service to society. In 1844 Nightingale decided that she wanted to work in hospitals. Her family objected strongly to her plan; hospital conditions at that time were known to be terrible, and nurses were untrained and thought to be of questionable morals. Ignoring all resistance, Nightingale managed to visit some hospitals and health facilities. She then received permission from her parents to spend a few months at Kaiserworth, a German training school for nurses and female teachers. In 1853 she became superintendent of the London charity-supported Institution for Sick Gentlewomen in Distressed Circumstances. This opportunity allowed her to become independent from her family and also to try out new ideas in organizing and managing an institution, conducted in a scientific, nonreligious setting. In October of 1854 Nightingale organized a party of thirty-eight nurses, mostly from different religious orders, for service in the Crimean War (1853–56), in which Great Britain, France, and Sardinia fought against Russian expansion in Europe. The nurses arrived at Constantinople (now Istanbul, Turkey) in November. Conditions at the British base hospital at Scutari (now Uskudar, Turkey) were awful and grew steadily worse as the number of sick and wounded soldiers rapidly increased. The British army did not have enough medical services and used what it did have poorly—a confusing and complicated supply system actually cut off deliveries to the patients. The Barrack Hospital, where Nightingale and her nurses worked and lived, was built on a massive cesspool (an underground area into which liquid waste flows), which poisoned the water and even the building itself. The general attitude was that the common soldier was a drunken brute on whom all comforts would be wasted. combined with the continuing arrival of the newly sick and wounded, soon brought this about. She also had a large fund of private money—much of it raised by the London Times —with which she could obtain badly needed supplies. By the end of 1854, some order had been created and the hospital was cleaner—not only through Nightingale's efforts but also through improvements made by a governmental sanitary commission. The death rate among patients fell by two-thirds. But with improvement came new problems, including anger from officials who were found at fault for the poor hospital conditions and rising disputes among the nurses. Florence Nightingale left Scutari in the summer of 1856, soon after the war ended. By then she was famous among the troops and the public as the "Lady with the Lamp" and the "Nightingale in the East." This popular image is not quite accurate. Although she did some active nursing in the wards, Nightingale's real work lay outside the expression of tenderness and concern. It began with her refusal to respond to public praise and with her use of her influence in high places, including with the queen, to fight for effective reform of the entire system of military hospitals and medical care. In Notes on Matters Affecting the Health, Efficiency and Hospital Administration of the British Army (1857) Nightingale used the experiences of the war to prove that a new system was necessary. Within five years this effort led to the reconstruction of the administrative structure of the War Office. Nightingale's Notes on Hospitals (1859) detailed the proper arrangements for civilian institutions (places that were not a part of the military). In the next year she presided over the founding of the Nightingale School for the training of nurses at St. Thomas's Hospital in London, England. After 1858 she was recognized as the leading expert on military and civilian sanitation (the removal of water-transported waste) in India. She also believed that irrigation (the supplying of water to an area using artificial methods) was the solution to the problem of famine. In 1907 Nightingale was the first woman to be awarded the Order of Merit. Nightingale's personality is well documented. She rebelled against the idle, sheltered existence of her family her entire life. She achieved a leading position in a world dominated by men, driving and directing her male coworkers as hard as she did herself. She often complained that women were selfish, and she had no time for the growing women's rights movement. But she also developed an idea of spiritual (relating to or affecting the spirit) motherhood and saw herself as the mother of the men of the British army—"my children"—whom she had saved. Florence Nightingale never really recovered from the physical strain of the Crimean War. After 1861 she rarely left her home and was confined to her bed much of the time. She died on August 13, 1910, in London, England. Vickers, Rebecca. Florence Nightingale. Chicago: Heinemann Library, 2000. Wellman, Sam. Florence Nightingale: Lady with the Lamp. Uhrichsville, OH: Barbour, 1999. Woodham-Smith, Cecil. Florence Nightingale. New ed. London: Constable, 1996. I was writen that Florence Nightingale 's family was her inspriation fore her work with the poor people.She was strong influence from her grandfather,Williams Smith that he also became to lost properties to follow the ideal. I think that Florence Nightingale was an inspiring woman that tried to make the world a better place. Although I would never have the guts to do so, she became a nurse and had to watch men and women endure crucial pain. FLORENCE NIGHTINGALE IS VERY INTERESTING. I'VE BEEN TO THE MUSEUM AND THE HOSPITAL. I LOVE FLORENCE NIGHTINGALE. I WISH SHE WAS STILL ALIVE. HOW BIG AN HONOR is it TO RECEIVE A fLORENCE NIGHTINGALE AWARD ? I know someone that just got one ! FLORENCE NIGHTINGALE is the type of person to have deep compassion for other people who are suffering. I know that the SPIRIT of FLORENCE will never die. I'm reading her biography written by Mark Bostridge these days. She is indeed an inspirational historical character. Thought of sharing some thoughts on the confusion going above regarding the support or the lack thereof from her family. From what I've read, Florence political and social thoughts had a lot of influence from her grandfather (nan) William Smith but he was not the source of her inspiration to pursue a career in nursing. Her genes from her gran did help her though, which was evident latter how she thoroughly studied and tried to evolve the medical institutions in a methodical way. She did not have a close bond with her mother as her mother, Fanny was a socialite and was most of the time busy organizing parties and finding ways to be in the circle of high society. She had a good understanding with her father but he too failed to understand how deeply she felt for the cause to serve the poor and sick. There's an abundance of her handwritten notes, a lot of which are written to herself, expressing the pain and anguish she experienced due too lack of support from her parents and her sister Parthenope. I think she is a very inspiring and amazing women the will never be forgotten. Here's something very few people are aware of. Did you know that FLORENCE NIGHTINGALE and H.G.WELLS passed away on the same calendar day of the year??? Nightingale passed away on August 13, 1910. Then 36 years later, Wells passed away on August 13, 1946. Well, something very interesting happened just a few days ago on Thursday, August 13, 2015. On that day, around 8:00 PM EDT the New Jersey Lottery EVE pick 3 was "287". Then, about 8 hours later on Friday, August 14, 2015 at 3:41 AM EDT, there was a Magnitude 2.7 EARTHQUAKE ( which 78 people reported feeling ) in northern New Jersey with its epicenter about 1 mile from Route "287". Then, about 9 hours later the New York Lottery MIDDAY pick was "287". Isn't it unusual for the number "287" to appear in the news THREE TIMES within about a 17 hour period of time?? ?